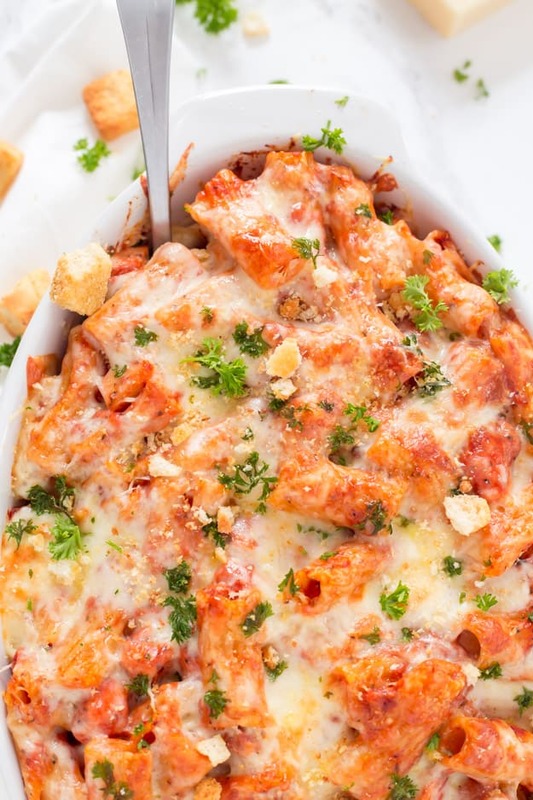 Easy Chicken Parmesan Casserole recipe is the perfect weeknight meal. Made with marinara sauce, parmesan cheese, mozzarella cheese, and topped with crunchy croutons for the extra crunch. One of my favorite recipes is chicken parmesan, and I can eat it every day, all day. The only bad part of that is I may get a little tired of if every single day. Right? Well, it’s okay to daydream about having it. That’s what I keep telling myself. Here’s an oldie, but a goodie easy chicken parmesan recipe you may enjoy. 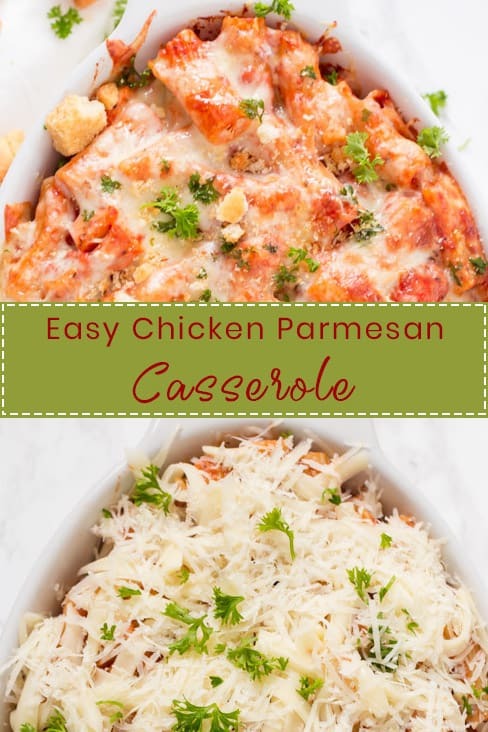 The best part about his easy chicken parmesan casserole is there is no breading of the chicken breasts, like in traditional chicken parmesan. It mays it a breeze to whip up! I guess if you wanted to bread the chicken breasts you can and I’ll share a tip on how to do it below, but it the breading may get a little soggy while it’s baking in the wonderful sauce. Up to you, my friend. 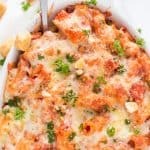 Hence the name of this recipe EASY chicken parmesan casserole I thought I would explain what makes it so easy. There is no breading of the chicken breasts at all. I only browned them beforehand to give the chicken a little more flavor. The second part that makes this recipe incredibly easy is you can use your favorite storebought sauce. Or if you are feeling like making your marinara sauce from scratch, I highly recommend my quick and easy marinara sauce. It’s just a few extra steps, and it does take a little time to simmer to allow the flavors to develop, but it’s nothing too complicated, I promise! 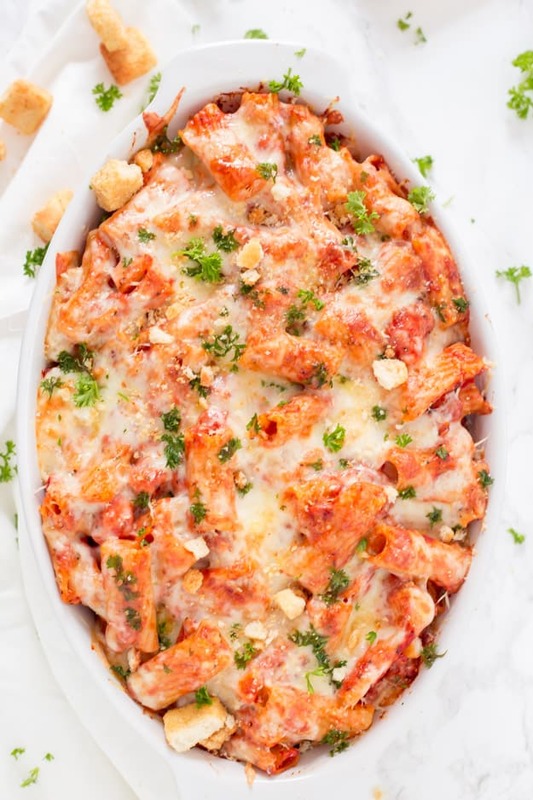 Traditionally a chicken parmesan recipe is started by pounding the chicken breasts into thin pieces, then seasoning your chicken, an egg wash and then dipping into your breadcrumb mixture. And then repeating the egg wash and breadcrumb. Once you have dredged your chicken, it’s time for a hot oil bath. You can use any oil of your choice, but I recommend vegetable oil. Then you will want to add your prepared chicken to a skillet when the oil is hot, not smoking, and then cook on each side until golden brown. Remove chicken add a little marinara sauce on top and finish with a slice of fresh mozzarella. I highly recommend using fresh mozzarella because it tastes so much better than the shredded kind in the bags. Trust me! And lastly, you will want to bake your chicken parmesan until the mozzarella is melted. My mouth is starting to water now. What if I want to bread my chicken parmesan? As stated above, here’s how I would bread the chicken breasts. It isn’t necessary because the sauce may get the breading a little soggy. But here it goes. I would start by pounding your chicken breasts until even and seasoning with salt and pepper. Prepare your breading station with 3 separate bowls: panko breadcrumbs, beaten egg, and all-purpose flour. Dip each piece of chicken into flour and shake off the excess. Then dip into the egg and then the breadcrumbs; repeat steps for all remaining chicken breasts. Add your oil to a skillet and turn the heat to medium-high. You want your oil to be hot, not smoking, and then add chicken. Cook for 5-6 minutes on each side until golden brown. 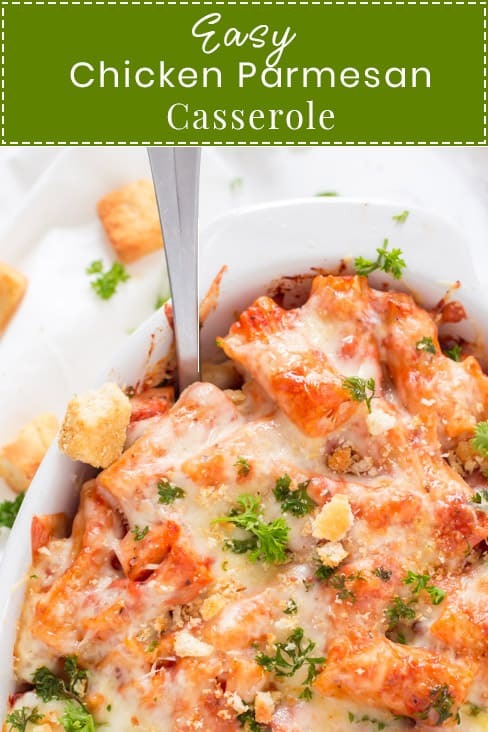 Then you will want to follow the directions for the easy chicken parmesan casserole. Cook the pasta according to the directions of the back of the pasta package. Drain and set aside once finished. While the pasta is cooking pound your chicken breasts into thin, even pieces. Season with Italian seasoning. Preheat oven to 350 degrees. Heat skillet over medium heat and add oil. Once the oil is hot, not smoking, add chicken breasts and cook for 5-6 minutes on each side or until cooked through. Slice into 1" chunks. 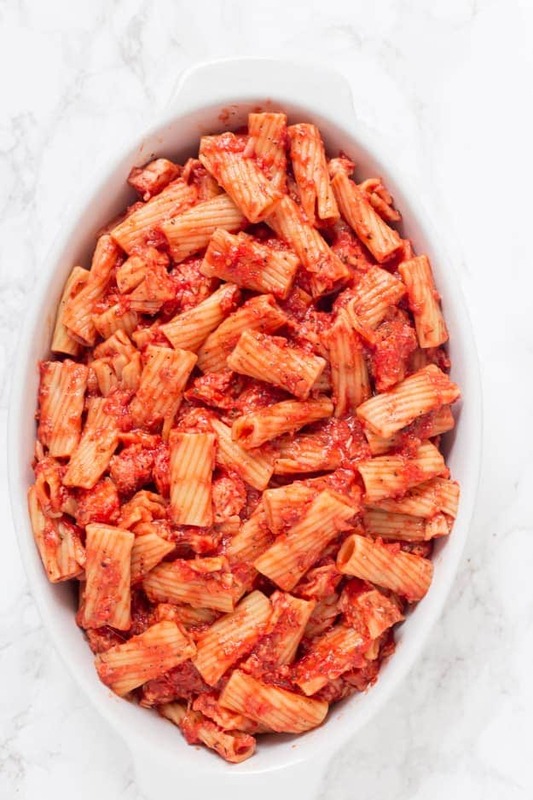 Mix the penne pasta, diced chicken, marinara sauce, 1/2 cup of parmesan cheese, 1 cup of mozzarella cheese together until combined in a large mixing bowl. Place mixture into a 9x13 casserole dish. 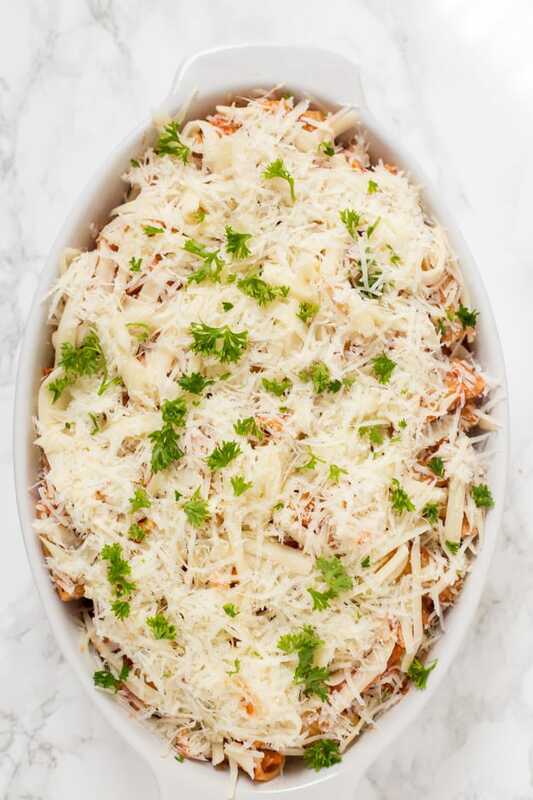 Add the remaining parmesan and mozzarella cheese on top of the mixture and bake for 30 minutes or until the cheese is melted. Garnish with lightly crushed croutons and serve. If you would like to make a homemade marinara sauce, I recommend my quick & easy marinara sauce.